After my hang out with Christine I headed back to the hotel I was staying at, Hotel Luxe, and got ready for the Clippers vs Kings basketball game at the Staples Center. 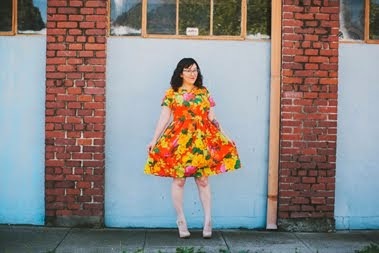 I made the dress above especially for the event :) It's my fourth Hazel dress and I am beginning to think it's my go to pattern. The fabric I chose for this one is wilddddd!!! I had my friend Marie take the photo of Luke and I. It was funny, on my way to the elevator I heard someone call my name. I looked over and it was Marie! We used to work together at the CCS call center in San Luis Obispo close to nine years ago. We have kept in touch through social networking, but I had no idea that she worked at the place we were staying at. Small world! 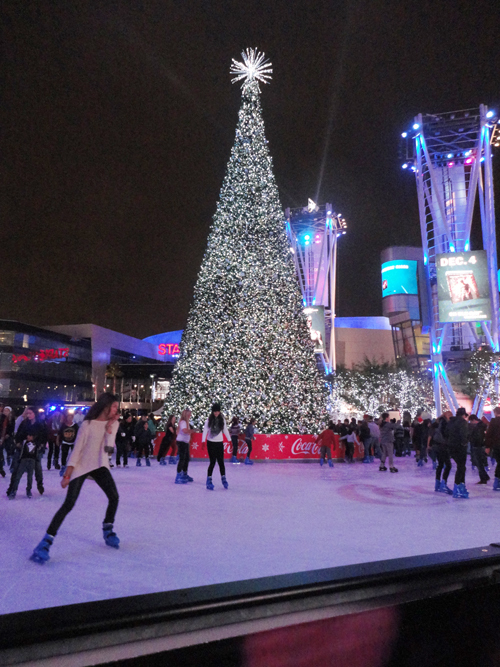 Next to the Staples Center there was an ice skating rink set up. It's kind of a big deal for a place that doesn't ever see snow, so the line was super long. 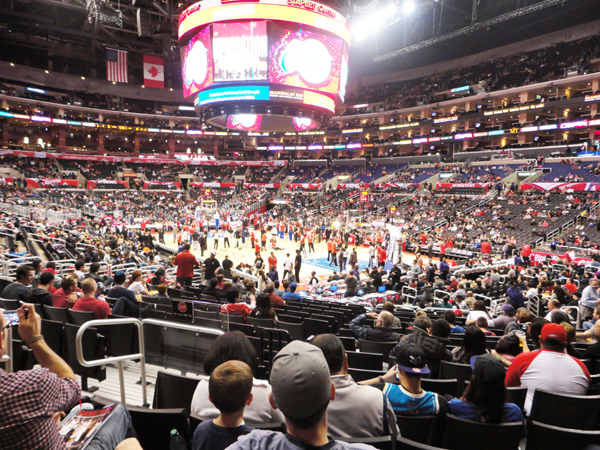 My game plan for the night was to walk on the court during warmups and talk to DeAndre Jordan. Last time it almost worked, but a security lady told me I had to leave :( This time I was determined, but they must have known I was coming because I got put in the seat with the stop sign in front of me. I decided not to push my luck. Next time I will think of a better way.... Does this make me sound like a full blown stalker? Because I'm not. My dress was definitely a conversation piece! My favorite comment of the night was when an older gentleman working security asked where one could buy a dress like the one I was wearing. When I told him that I made it he got really excited and called over his coworkers to look. It was really cute! We had ok seats, but the picture doesn't do it justice. I think we were in the 17th row. And before you start thinking that I am the biggest Clippers fan let me make it clear that I'm not. Clipper Darrell is the official number one fan. The dude wears half red, half blue outfits and even drives a half red and half blue car. He is so entertaining at games and luckily we were sitting close to him. He gets the crowd pumped up with his cheering/yelling, gets the wave going, and does some awesome dancing. 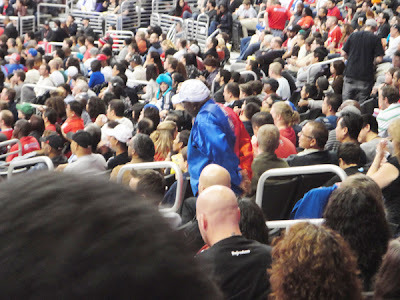 When the Clippers dancers are doing dance routines during time outs, Clipper Darrell will step into the aisle and mimic their dancing, even if that means getting on the ground and rolling around. He is a crack up!!! Ahh! Love this dress! 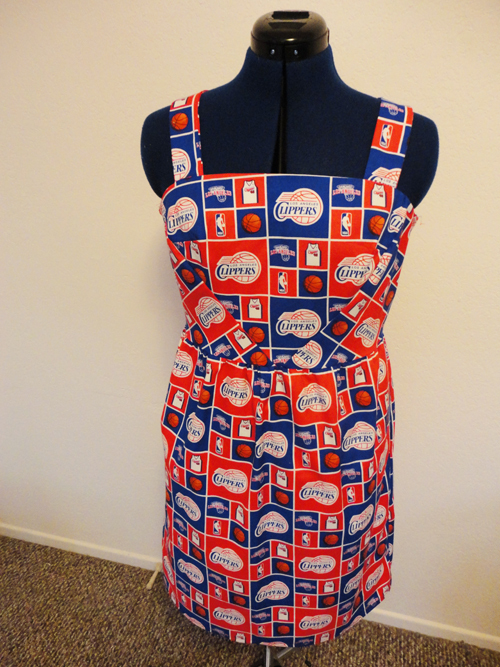 Now I feel like I need to find some Bears fabric and make a gameday dress! I knew you'd get comments on your dress!! It IS pretty amazing in fact. what a fun dress! I'm not a big fan of going to games because I feel like I would stick out like a sore thumb! 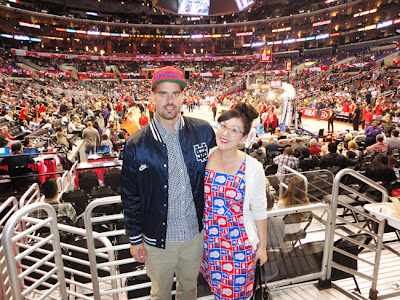 I just found your blog through Jill, and I can't believe there's another sewer / clippers fan out there! 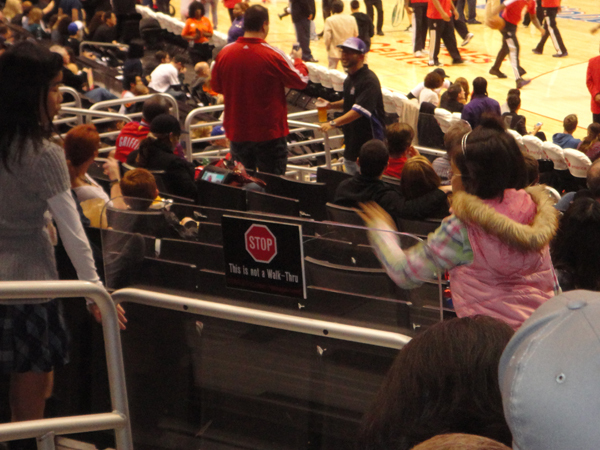 We were just at the Bulls game and I really want to go to the OKC game in March. Go Clippers!! SO cute!! I figured it would be a huge conversation piece. The best part of going to a game is the people watching and that Darrell sounds like a character! What a worthwhile dress to make and wear. Glad you had a ball. 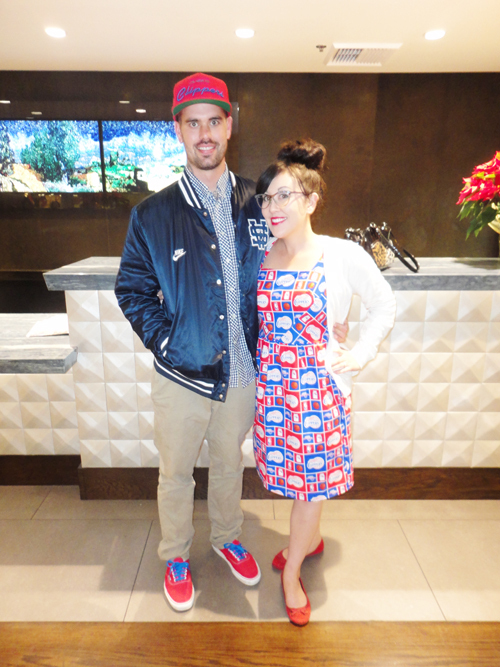 Your clippers dress looks adorable on you! Cheers for you and your team spirit! hahaha awesome! Sweet old biddies can be such heart-warmers sometimes! I'm not half surprised it was a conversation piece. I'm expecting my Hazel pattern to arrive anyday now so I'm looking forward to trying it out! I LOVE your dress. I bet you were "the bell of the ball".